Right in the centre of Broadway over looking the village green next to ancient, domed yew trees, is the half - timber framed and honey stoned Broadway Hotel. Originally built as a rural retreat for the Abbots of Pershore in the fifteenth century The Broadway Hotel is still the perfect place to escape to today. 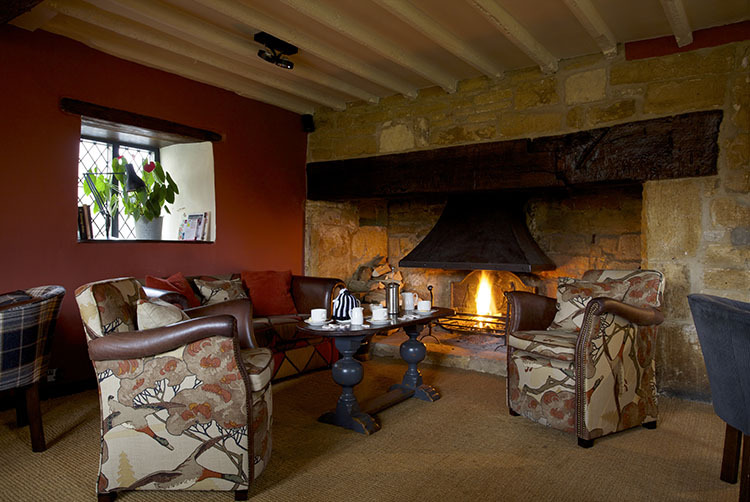 Whether afternoon tea by the fire, an intimate candle-lit dinner or a drink on the front terrace on a warm summer's evening you'll soon relax into the Cotswold way of life. Tattersalls Brasserie is to be found in the centre of The Broadway Hotel in the beautiful new Atrium. The elegant, light filled brasserie offers an extensive a la carte menu with a good selection of fresh and seasonal dishes along with a choice of 31 day dry aged free range steaks. Alternatively you can relax in The Jockey Bar and enjoy a drink and a bite to eat in one the oldest parts of the hotel. Tariffs are per room, per night and inclusive of full English breakfast and VAT at the current rate. The above tariffs are not available during Christmas, New Year, Valentines and Cheltenham Gold Cup and are subject to availability. Corporate rates available on application. All tariffs are subject to alteration without notice. The 19 bedrooms have all been recently refurbished to combine country house style with modern designer fabrics. Arrive at your leisure to enjoy a complimentary glass of wine before partaking of a splendid three-course Sunday lunch (please advise your required time when making your booking). Relax with a choice of Sunday newspaper (state your preference on booking), laze with a book or magazine, or take a stroll and enjoy this pretty Cotswold village. £76 per person based on two guests sharing a standard double/twin room on the Sunday evening. A 25% non-refundable deposit is required when making a booking to guarantee your reservation. We regret that due to our limited number of rooms, it is necessary to impose strict cancellation charges. Cancellation made less than 72 hours prior to the arrival date will result in a charge equivalent to the value of the first night's stay. All rooms have private bathroom en suite, remote control colour television, radio, hair dryer, tea & coffee making facilities and direct dial telephone. We do accept dogs by prior arrangement.